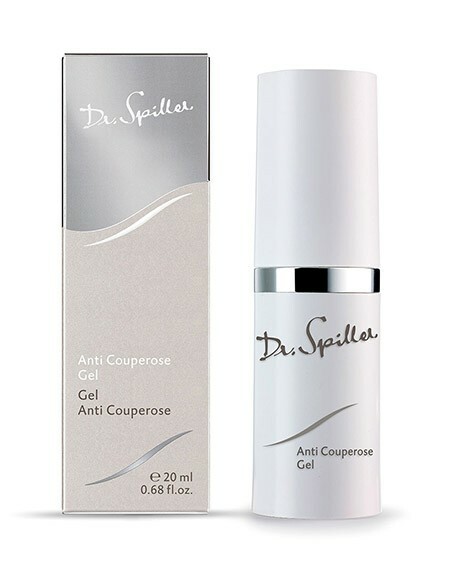 Anti Couperose Gel is a concentrated intensive skin care for skin prone to dilated capillaries. It fortifies the walls of the blood vessels and corrects the skin’s appearance. Anti Couperose Gel is a concentrated intensive skin care for skin prone to dilated capillaries. It fortifies the walls of the blood vessels and corrects the skin’s appearance. Rutin is the active agent that protects the walls of the capillaries, while Ginkgo Biloba Extract tones the skin and strengthens the blood vessels. This not only optimizes the complexion but also helps prevent the worsening of couperose. Apply Anti Couperose Gel to face and, if needed, décolleté, morning and evening after cleansing. Follow with Anti Couperose Cream or appropriate active ingredient cream.